Today we are proud to launch a new Mozilla Webmaker app to the world. 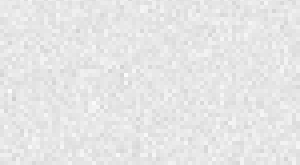 Meet Thimble, the new tool that makes it incredibly simple for anyone to create and share their own web pages and other projects in minutes. 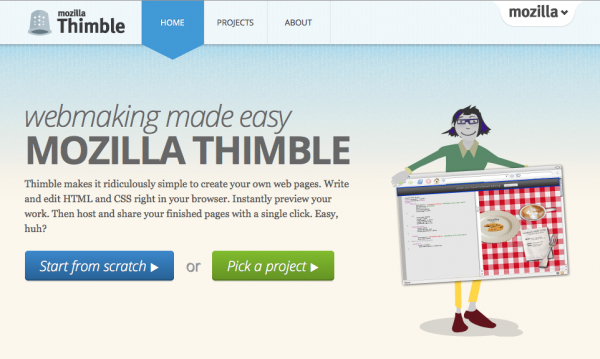 Thimble is webmaking made easy. It’s an intuitive visual editor that lets you write and edit HTML right in your browser, preview and correct your work, and then publish and share fully functional web pages with a single click. Thimble removes many of the barriers for novice users trying to learn code, and includes a series of starter projects and templates to help anyone get started quickly. Wired Webmonkey calls Thimble “one of the friendliest, easiest-to-use code editors we’ve seen.” We’re extremely excited about it, and it’s at the heart of Mozilla Webmaker’s mission to move people from using the web to making the web — and to create a more web literate planet. To mark the launch of Thimble, we’re also unveiling a new Mozilla Webmaker web site today. Check out the new webmaker.org. The new site includes projects to help users make and learn with Thimble, plus other Webmaker tools like Popcorn and the X-Ray Goggles. We’ve got great new projects to help you do everything from tweaking your blog template, to making interactive videos, to creating fantastic 3D web pages — including projects from partners like Tumblr, the London Zoo, the New York Public Library and many others. The Summer Code Party starts this weekend! We’re inviting the world to use these new Mozilla tools and projects as part of our big summer learning campaign, the Mozilla Summer Code Party. The party starts June 23 with a “Global Weekend of Code” and rolls all summer long. So far, more than 330 Summer Code Party events have been created by community members around the world. It’s a great chance to learn more about coding and how the web works by making something fun with family and friends. You can find an event near you or start your own here. Try Thimble for yourself now. 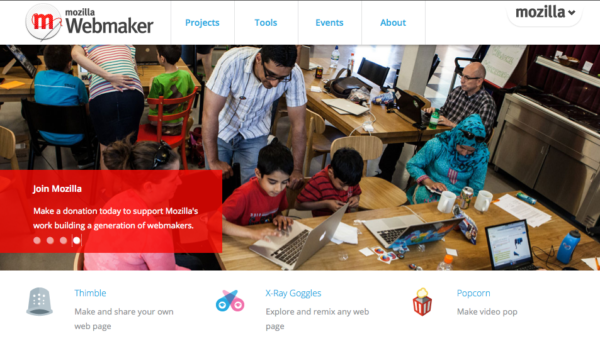 Learn more about Mozilla Webmaker and check out the new webmaker.org site. Join Mozilla’s Summer Code Party. Find an event near you, or start your own using our handy event guides. People around the world will get together to make and learn this weekend using Thimble and other new Webmaker tools and projects. It's all part of the Mozilla Summer Code Party, and it kicks off June 23.